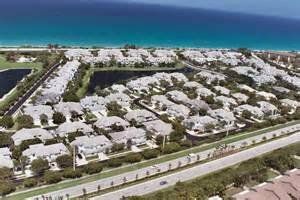 This active lifestyle, beachside community located east of US1 consists of 257 units that range in size from 1,200 to 2,200 square feet and offer two to four bedrooms. Sea Colony is the ultimate in resort living at an affordable price. This 24 hour manned, dog-friendly community with direct ocean access has it all. The large pool area features a covered outdoor entertainment area, covered hot tub, fitness center, tennis courts, walking paths and a private gated walkway to the beautiful Jupiter Beach. Sea Colony is conveniently located to restaurants, shopping, and entertainment venues. Palm Beach International Airport is approximately 20 minutes away.